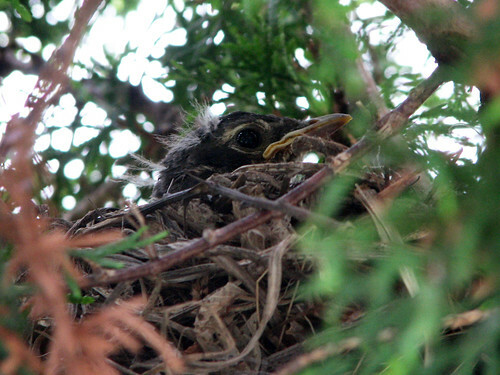 Late last month we first noticed an American Robin nest-building in our front shrubs. I had my first peek inside the nest on May 3rd. Two chicks hatched on May 11th. I took a final look inside on May 17th to find two six-day-old chicks. Even though I didn’t look inside the nest again, the site was visible from inside our house, so I still kept an eye on the babies. On May 21st the babies were getting too big for the nest, and at times it was hard to see the second baby behind the one closest to our window, especially if they weren’t moving. On May 24th the babies started stretching their wings a lot and standing up on the side of the nest. 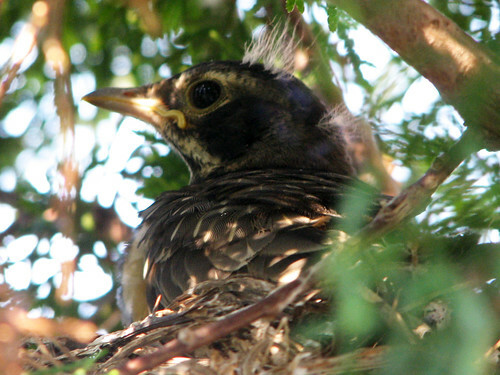 Based on the lifecycle of the American Robin, I expected the baby robins to fledge on May 25th – and that’s exactly when they did! Early in the morning one of the babies ventured onto a branch about a two feet from the nest, higher up in the tree. There it sat for several hours, eventually dozing on its perch. The other baby sat up in the nest. 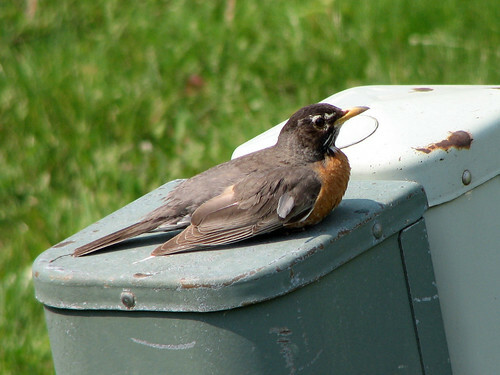 Meanwhile, Pa Robin rested on a utility box in our front yard, facing the nest tree. In the afternoon I saw the baby was not on its branch any more. There appeared to be one baby in the nest, but I wasn’t sure. At about 7:30pm I noticed Pa Robin looking for worms in our back yard, and then I spied a baby robin sitting close to some evergreen trees in our neighbor’s back yard. Pa Robin brought the baby a worm and then then both hopped together in the neighbor’s back yard. 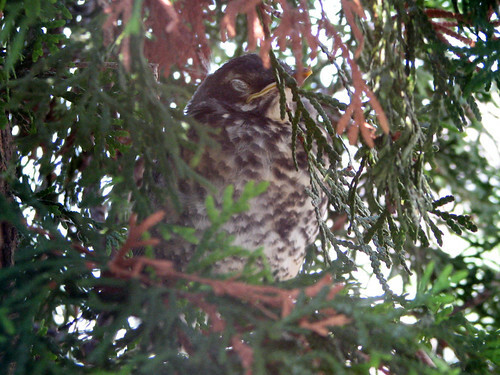 I looked at the nest tree again and now found the second fledgling on a branch about two feet from the nest. Then I closed the curtain for the night. This morning there was no sign of any baby in the nest tree. But I saw Ma Robin hanging around the front yard, so I guessed one of the babies might still be nearby. Then I noticed Ma Robin pull a worm from our front lawn and hop into a nearby, heavily leafed tree. She emerged a moment later, without worm. This entry was posted in Citizen Science, Yard Birds. Bookmark the permalink. What a wonderful post! The pictures and the video really relive that experience along with the story. I thank you for sharing this. Your vast research and experience is amazing. I have your blog favorited.